26th Oct - 30th Oct 2012.
email: eaglesnestsa@gmail.com or lyn.edgewalker@gmail.com to register and for banking details. •	Prepare prayer bundles. Information on what you need and how to go about this will be provided. You will begin as soon as possible. •	Begin journal of prayers. 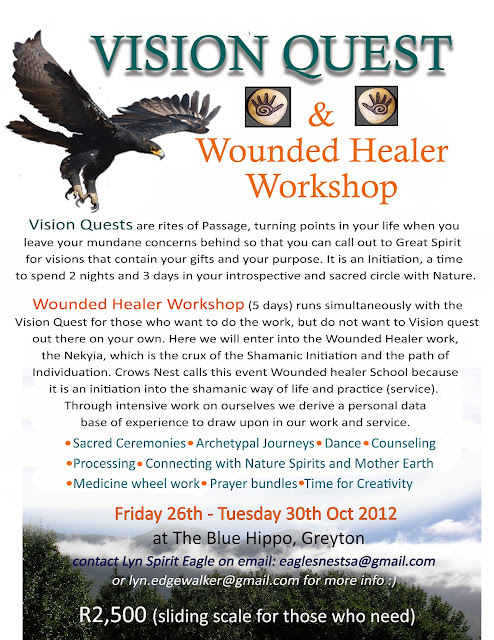 •	Collect materials for prayer bundles also materials for making your talisman. Information will be provided. Wounded Healer people bring their materials for prayer bundles and talisman. Food for all your meals. (Vision questers will only need food for the time at camp). There is a good communal kitchen at The Blue Hippo. It has cooking and fridge facilities. We can talk more about this later. We will sleep in the tipis and tents. We have invited Tracy Armbruster to take us on a foraging walk on Friday morning. Tracy is wild about weeds and it will be very edifying to know our wild plant friends better. We will let you know times for this. 3-5 pm Vision Questers and allies go find where questers would like to sit in their circle and come back. Wounded Healer people go with them because they will be the ones taking them water on Sunday and we need to know where they will be for two nights. Nekyia talk about descent and our rite of passage as Heroes on your journey. The Heroes journey entry, descent and return, thus broadening your cartography of Psyche and Cosmos. It is igniting the shaman within, waking up your potentiality in an earth-honoring and heart opening way. Circular Fire dancing and drumming. To call in our Spirit helpers, to show them the sincerity of our intention and to let our bodies know. 9pm -Archetypal journey for empowerment and insight. Wounded Healer workshop begins: Morning Fire circle. Medicine wheel work: aids in finding directions for the weekend’s work. Prayer Bundles. Preparing and check-in assessment. Take prayer bundles and go off to place them. This is a journey too. Go and take questers water. This is part of the chop wood carry water of service, a mission. Noting Nature spirits and the magic of the ordinary. Chill circle and individual sessions. Questers begin to return in the morning and need to be back by midday. Wounded Healers in camp making a talisman. Communal sharing of what has been found.